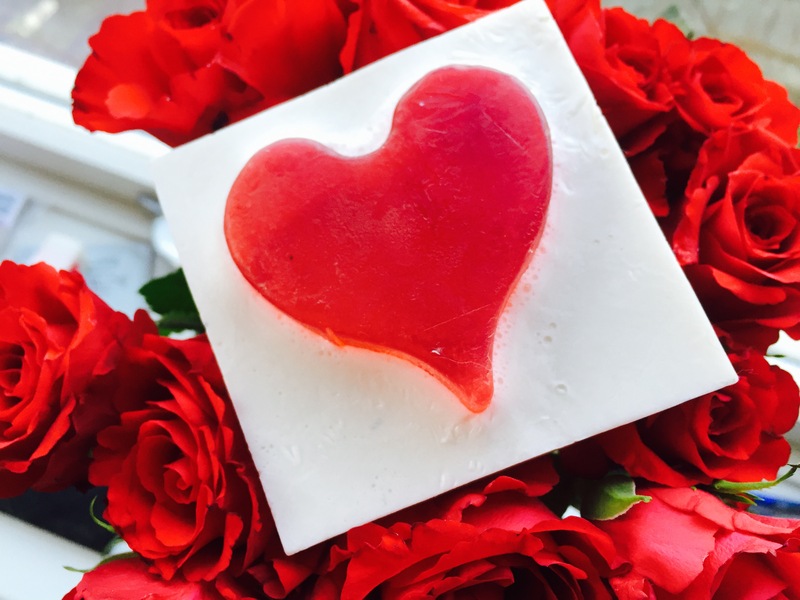 To celebrate the day dedicated to love and romance, I made this strawberries and cream scented love heart soap. It is a simple melt and pour recipe. I dedicate this soap to my wonderful partner. He has put up with my non-stop rambling of potential soap recipes, burnt trial hot press soaps and many hours of “umming” and “ahhing” over amazon soap equipment purchases. Without him I would not have started this blog that I love so much. OK enough of the mushy stuff, let me show you how I made it and what I used so you can have fun making it yourself at home. Just to add, I made mini versions first as a trial before the real thing. I’m going to be honest, I rushed it and poured the second soap in too soon and melted the corners of the hearts. Poor things. Cut the Melt and Pour soap base into centimetre cubes and place them in a microwave safe container. Set the microwave to high for 10-15 second bursts. Once the soap base has melted add your red dye . Mix thoroughly. Pour the mixture into the moulds, spray with rubbing alcohol and place somewhere safe for a day. You want to avoid my first mistake and not put the second soap on these when they are not completely set. You will end up with colour run and melted edges which we do not want for this soap. I actually left my second batch for a week before adding the white base, mainly because I forgot and started new soaps, but I digress. 3 g Strawberries and Cream Fragrance Oil from Authentic Oil Co.
Place your set heart soaps in the dish with 5 cm space around each one. Balance something heavy and flat on top of them. this stops them floating upwards when the second soap is added. Melt your goats milk base in the microwave. Once all lumps have melted, add your mica and fragrance and mix thoroughly. Slowly pour the melted strawberry and cream scented soap into the large dish around the hearts. be careful not to splash any white onto the red hearts. Carefully tap the mould/dish on the work surface to get rid of any bubbles and to even the mixture. Lightly spray the top of the white soap base with rubbing alcohol to eliminate the last of the bubbles. Place somewhere safe to set for the next 24 hours. I used an oven dish to set mine. Be careful, you can see my finger print where I tested it to see if it was set after 20 minutes. It wasn’t! The tricky part was getting them out as I am used to silicone moulds. I sliced through and then ran the knife around the edges of the dish. The sides were a little uneven but I continued to trim them after they were out of mould. Also another thing to look out for is that the weight you place on top is heavy enough. I noticed after I removed them from the dish that a little bit of sneaky white soap had set underneath. So there you have it. My Cupid’s Arrow Strawberries and Cream scented soap. I hope if you make this soap at home that you enjoy it as much as I did.